Calgary Rants: Toronto Jack... It is a Matter of Confidence! 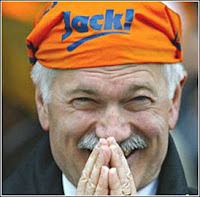 I could not help but laugh at our NDP friend Jack Layton all week! After getting a little too excited over the possibility of finally receiving a "coalition" cabinet post and having a real say over the affairs of the country, he is now reduced to his usual post of Mr. Irrelevant. With speculation that the "coalition" is all but dead following the vaulting of Ignatieff as Liberal Leader, poor Jack is left grabbing at straws and trying to get some attention for himself in the media. For a leader of a party that only obtained 18% of the Popular vote in the last election, and is currently sitting at 14% in the most recent poll data released this week, Mr.Layton seems to have an inflated sense of importance. You are right Jack, it is a matter of Confidence and Trust... its too bad that you fail to accept that the people of Canada do not have ANY of the above in your leadership or party. If they did, you would actually matter in Ottawa. Calling Social Democrats is the same as calling Conservatives Fascists. There is a difference, wouldn't you say?